According to the proposals from the Compromís collective meetings, sectoral meetings, interviews and contributions from the website “100 proposals for the future of El Campello”, the Compromís Campello collective has adopted the following municipal program. – To review all service contracts and municipal taxes. – To review budgets and expenditures of all departments. – To publish the establishment plan for the community each year. – A strategic management of the Town to make it more efficient. – To create communication channels with citizens. – To set up a central point of contact and a remote management service using the Internet. – To set up a web portal transparent to the citizens. – To promote an open policy. – Strengthen local trade. Study and agree the creation of a municipal market. – Create the Economic and Social Council. – Create a strategic plan for tourism. – Attracting new industries and services to diversify economic activities. – Create a business incubator focused on technology and innovation. – Boost fishing, drive marine tourism and make agricultural land available again. The economic crisis has affected many families and young people, especially those who worked on construction or tourism sectors. The dropout rate or the lack of vocational studies are factors which make even harder the job research. – We will use the skills and local resources to develop training activities aimed at the occupation and entrepreneurs. – We will demand the Government and the Provincial Council resources to implement an occupational plan for youth employment, long-term unemployed and people with disabilities. – We will take the most of European and Spanish resources to encourage entrepreneurs and occupation. – We will give priority to companies of El Campello or those which create stable jobs. Schools of El Campello are overcrowded. The Town Council has paralyzed the School Board. No public kindergarten is offered for children from 0 to 3, and no vocational training center as well. Compromís believes that education and vocational training to get a job are priority rights of children and youth. – Activate the Municipal School Board and make it competent in budgeting and planning centers. – Review education buildings. An infrastructure plan in the education sector is required. – Enlarge the Enric Valor Institute building. – Promote the creation of vocational modules in El Campello and facilitate access to vocational training centers of the region. – Implement the municipal kindergarten from 0 to 3. – Implement a training program for young unemployed and long term unemployed. Different manifestations of the culture of a town, including festivals, are a sign of wealth, of identity and social values. They are also the perfect atmosphere for meeting other neighbors and the stimulus for structuring the society around solidarity and open-minded values. But culture and festivals are, or may be, a way to improve the community life of people, an element that will make visitors and tourists come here, a way to integrate foreign people and European residents especially. – Create a Popular Council of Cultural and Musical Associations. – Create a Popular Council of Festive Associations. – Improve the current cultural activities schedule in collaboration with cultural associations. – Enable some new festive activities collaborating with festive associations. – Ensure an attractive cultural program throughout the year. other towns and other cultural institutions (theater, music, exhibitions…) universities, etc. It seems that the town is half done. The neighborhoods are disconnected from each other and from the center. El Campello is below the average in communications and services with other towns in the region. In many neighborhoods and buildings, it is not taken into account the risk of flooding. – The connection and mobility between neighborhoods and urban areas of the town. – The rehabilitation of houses and its rental, especially for the youth. – The removal of urban barriers and the increasing of green areas and play areas. – Improving communications and frequency of transport services with other towns in the region, Villajoyosa and Benidorm. • A cleaning and maintenance plan of the Montnegre Rivera and oter natural spots here in town, cooperating with the competent squads. 6. Environment, agriculture and fishery. The marine and terrestrial environment of the town and its municipality have been degraded and abandoned pending an urban use or because neither land nor sea were good sources for living. Terrestrial and marine environments have a great environmental value: they create a pleasant atmosphere in town and they attract a kind of tourism looking for protected, green, well-preserved and natural environment. – A plan to protect the coast, with a specially between els Banyets and Villajoyosa. – The revitalization of fishing and tourism initiatives to connect with the fishery and sailor world. – Initiatives to recover agricultural areas and boost agricultural uses..
– A plan to increase the wooded areas. – The promotion of a new consumption economy (energy and water) and recycling. – A contract review of “Les Canyades” dump. – The regional collaboration for the good management of the wastewater treatment and desalination plant of the river. In recent years, El Campello has grown but it has not increased health resources. Also, when the holidays arrive, there are many foreign people who need health cares in our centers. The town has a percentage of elderly of the 18%, among European neighbors (the new neighbors) and residents. The Town Council needs to promote lifestyle habits and sport activities to improve the quality of life and welfare of the residents, especially the elderly and dependent, to prevent their social exclusion. Working women marginalization, they suffer abuse and repression that are not acceptable in a modern society. The Town Council, like other governments, has to introduce equality values in education and promote participation of women in public life. Women have particularly suffered the crisis, so we have to promote the creation of enterprises and cooperative business that promote and organize the working women. The diversity of gender and sexual orientation as well as the diversity of origins, languages and cultures, is a value that can enrich society in El Campello. It is necessary to establish integration policies for mutual respect, policies that will promote equality between all neighbors. (north) and Horta Beach (south) with the Valencian Health Ministry. – Enable a plan of healthy activities for elderly and dependent. – Promote volunteering to support elderly and dependent. – Updating the sports infrastructure, including schools, to promote healthy sport activity and competitive sports. – Implement a plan to promote equality between men and women. – Create support schemes targeted at groups in a situation of poverty and marginalization. In recent years there has been a social change in society. Since the beginning of the economic crisis, the discrediting of many institutions and the political class, citizens are no longer satisfied with voting every four years. We want our opinión to be heard when making decisions that may affect us. 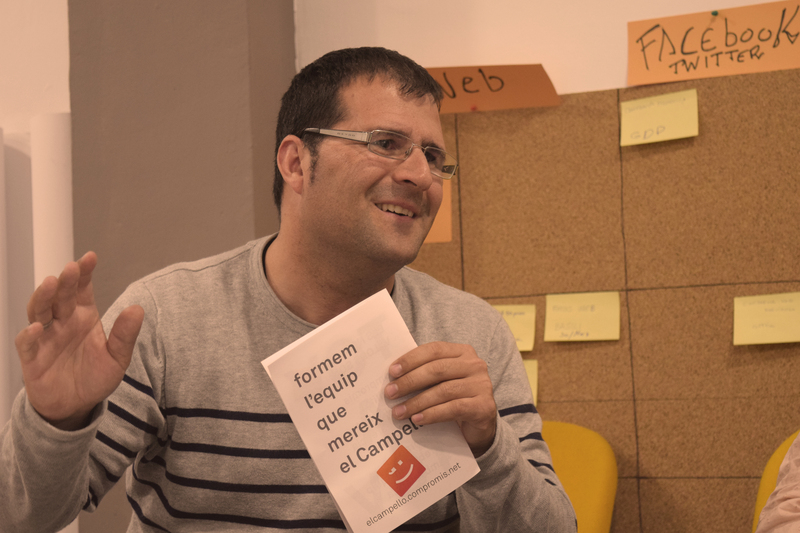 Compromís works for the common good and responsibility of the neighbors. So the Town Council will promote citizen participation in making decisions that affect them. Public resources are limited and without good citizenship the town can not be kept clean at all. If we want a clean, green and livable town, neighbors have to help with good civic behavior. – Delimit the parts of the budget that can be earned with the participation of associations and Town Council technicians, prepare the operating regulations and implement it as soon as possible. – Enable face or via web systems for complaings, suggestions, questions or greetings. – Develop an action plan to improve the civic use of space, resources and public infrastructure. Youth is unattended and without many prospects. More than half of young people of working age, who do not study, are unemployed, have mortgages, live with their parents or have financial difficulties. – A Youth Club house under shared management. – A leisure and culture program. We think that the diversity of languages is a richness, a value and not a problem. Languages are a reflection of the mobility of people for work, holidays or break. Cultural diversity is an element that is now part of El Campello and we have to take care of it for all, both for those who live here and for those who visit us. In the Valencian Country there are two official languages, one of them, our own language, Valencian, as defined by the Statute of Autonomy, is at a disadvantage and does not have public media. It can not fulfill its inclusive and host function despite their presence in education and in many areas of public life. The Town Hall and the government must pay special attention. The Town Council must develop a plan of equality between the two official languages and get the entire administration involved. – Develop an equality plan of the official languages at the municipal level. – Make a census of the languages spoken in town. – Promote the use of non-official languages spoken in the village to certain areas of municipal management for residents and certain cultural and festive activities, such as Dutch, English, French or German. – Activities and partnerships for cultural exchange will be promoted.